As a teen in his native Taiwan, Bo-wen Shen observed helplessly as typhoon after typhoon pummeled the small island country. Without advanced forecasting systems, the storms left a trail of human loss and property destruction in their wake. Determined to find ways to stem the devastation, Shen chose a career studying tropical weather and atmospheric science. Now a NASA-funded research scientist at the University of Maryland-College Park, Shen has employed NASA's Pleiades supercomputer and atmospheric data to simulate tropical cyclone Nargis, which devastated Myanmar in 2008. The result is the first model to replicate the formation of the tropical cyclone five days in advance. To save lives from the high winds, flooding, and storm surges of tropical cyclones (also known as hurricanes and typhoons), forecasters need to give as much advance warning as possible and the greatest degree of accuracy about when and where a storm will occur. In Shen's retrospective simulation, he was able to anticipate the storm five days in advance of its birth, a critical forewarning in a region where the meteorology and monitoring of cyclones is hampered by a lack of data. At the heart of Shen's work is an advanced computer model that could improve our understanding of the predictability of tropical cyclones. The research team uses the model to run millions of numbers -- atmospheric conditions like wind speed, temperature, and moisture -- through a series of equations. This results in digital data of the cyclone's location and atmospheric conditions that are plotted on geographical maps. Scientists study the maps and data from the model and compare them against real observations of a past storm (like Nargis) to evaluate the model's accuracy. The more the model reflects the actual storm results, the greater confidence researchers have that a particular model can be used to paint a picture of what the future might look like. "To do hurricane forecasting, what's really needed is a model that can represent the initial weather conditions – air movements and temperatures, and precipitation – and simulate how they evolve and interact globally and locally to set a cyclone in motion," said Shen, whose study appeared online last week in the Journal of Geophysical Research –Atmospheres. "We know what's happening across very large areas. So, we need really good, high-resolution simulations with the ability to detail conditions across the smallest possible areas. We've marked several forecasting milestones since 2004, and we can now compute a storm's fine-scale details to 10 times the level of detail than we could with traditional climate models." The cyclone's birth prediction is possible because the supercomputer at NASA's Ames Research Center in Moffett Field, Calif., can process atmospheric data for global and regional conditions, as well as the fine-scale measurements like those around the eye of a storm. 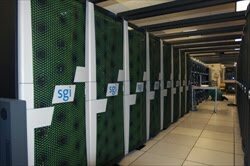 NASA built the Pleiades supercomputer in 2008, incrementally boosting its processing "brain power" since to the capacity of 81,920 desktop CPUs. The upgrades laid the groundwork for Shen and others to gradually improve simulations of varying aspects of a storm – from simulations of the path, then intensity, and now the actual genesis of a storm. The improved simulations can translate into greater accuracy and less guesswork in assessing when a storm is forming. "There is a tendency to over-warn beyond the actual impact area of a storm, leading people to lose confidence in the warning system and to ignore warnings that can save their lives," said study co-author Robert Atlas, director of the National Oceanic and Atmospheric Administration's (NOAA) Atlantic Oceanographic and Meteorological Laboratory in Miami, Fla., and former chief meteorologist at NASA's Goddard Space Flight Center in Greenbelt, Md. "Although we've seen tremendous forecasting advances in the past 10 years – with potential to improve predictions of a cyclone's path and intensity -- they're still not good enough for all of the life-and-death decisions that forecasters have to make. Tropical cyclones have killed nearly two million people in the last 200 years, so this remaining 'cone of uncertainty' in our predictions is unacceptable." As promising as the new model may be, Atlas cautions that "Shen's model worked for one cyclone, but it doesn't mean it'll work in real-time for future storms. The research model Shen and predecessors at NASA have developed sets the stage for NOAA's researchers to hone and test the new capability with their own models." Shen's use of real data from Nargis – one of the 10 deadliest cyclones on record – with the new global model also yields insights into the dynamics of weather conditions over time and across different areas that generate such storms. "In the last few years, high-resolution global modeling has evolved our understanding of the physics behind storms and its interaction with atmospheric conditions more rapidly than in the past several decades combined," explained Shen, who presented the study last month before peers at the American Geophysical Union's Western Pacific Geophysics Meeting in Taipei, Taiwan. "We can 'see' a storm's physical processes with this advanced global model – like both the release of heat associated with rainfall and changes in environmental atmospheric flow, which was very difficult until now."